Polka dots have always been an iconic pattern in haute couture, synonymous with refinement and elegance, and which does not suffer from the passing of time, retaining its original charm. Applied to ceramic, it is ideal for conferring the seductive quality of couture to the sanitary ware, making an everyday object a true luxury. 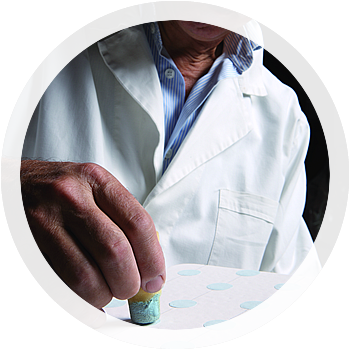 rhythmically rests the sponge on the surface at regular intervals adjusting the pressure with accuracy so that the colour does not run during the firing process. The name “Ora” (Now) emphasises the accuracy of the time cadence: each dot is the effect of a precise pressure of the brush on the ceramic.